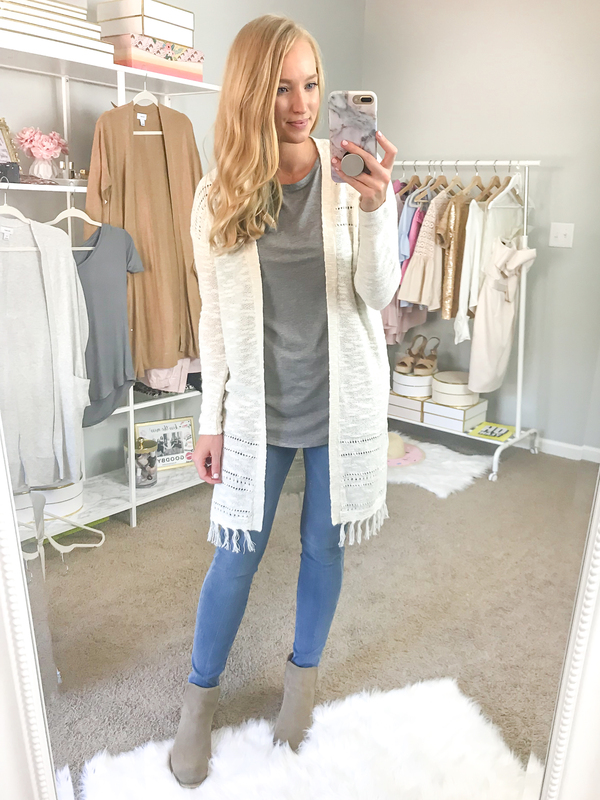 I recently shopped at Old Navy for some new Fall basics and here is what I picked up! Some things surprised me as far as comfort and fit, while others were disappointing and I ended up returning. I’m excited for the weather to cool down in GA because Fall is my favorite season! If you’re coming from Youtube, here are all the links to the items you’re looking for! Comfortable but super chic? Yes please! 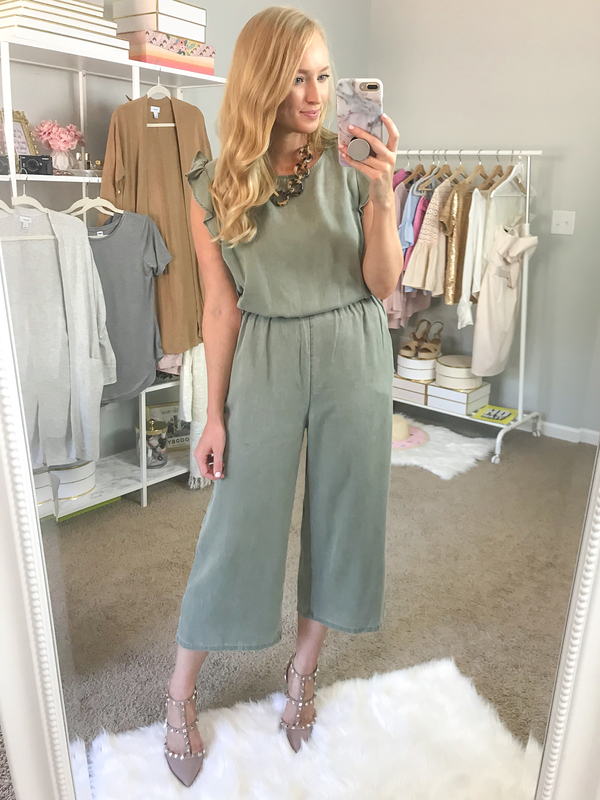 This ruffle shoulder jumpsuit will definitely help you stand out in the crowd. I’m wearing a small here, but since it’s a flowy design I exchanged it for an XS. You want enough room to let the top roll over and cover the waistband. I paired it with these Valentino dupes (size up). 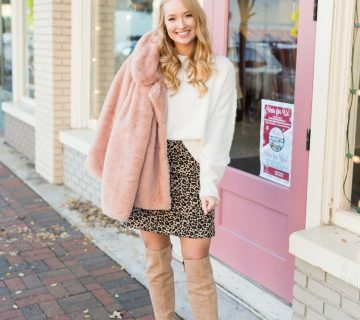 The shoes you pick to wear will definitely make or break this outfit! 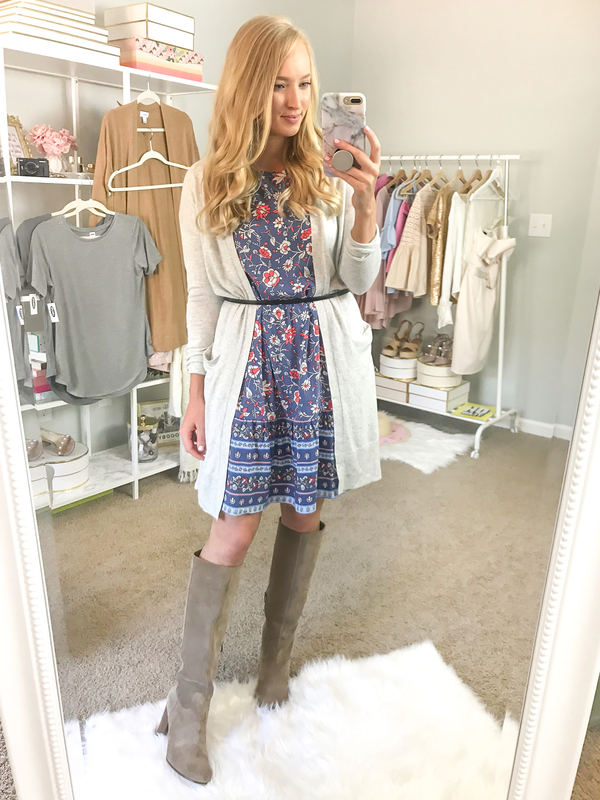 This dress could be worn now with cute wedges or later as styled here with a cardigan and boots. I styled it both ways on my Youtube channel. I think adding a wool hat would also be a great addition to this outfit. I prefer it belted to give my waist more definition. I’m wearing a small and it fits true to size. 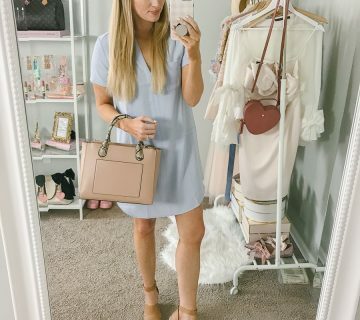 The dress feels like the typical Old Navy material and will easily wrinkle if you don’t hang it. I bought two different sizes in this cardigan to show you the sizing. Here I’m wearing an XS and I prefer this fit. It’s very soft and lightweight and would be great for work wear or on the weekends. 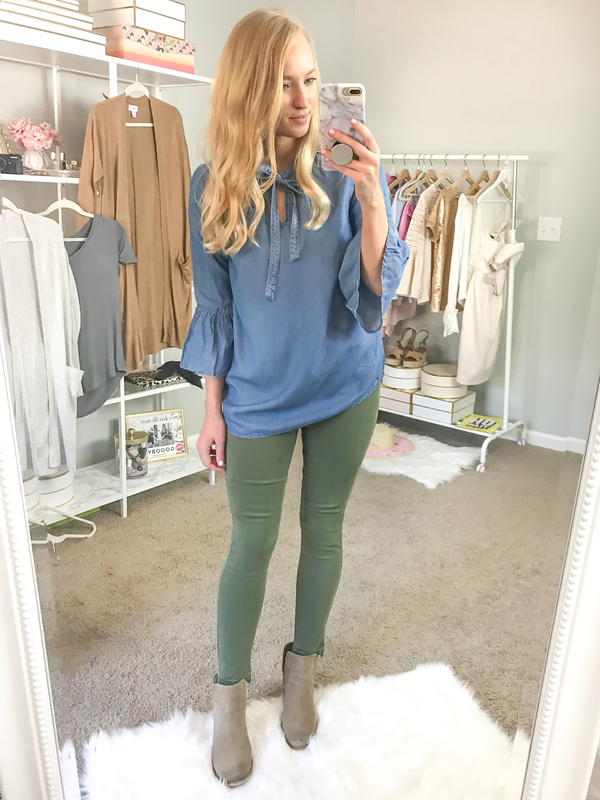 These olive jeans are a dupe for the 7 For All Mankind jeans I styled from my Nordstrom Anniversary Haul. The hem is identical! They are stiffer and definitely cheaper feeling, but I like the fit better on me. Here I’m wearing a 6. I returned this pair because they had a stain on the leg, but I’m ordering another pair online (the deals are always better online versus in-store). I’m not a fan of how this v-neck tee hangs and clings to my waistline. It feels more fitted than the other style I picked up, so I returned it. I’m wearing a small here, but if you want the v-neck style I would size up. Here I’m wearing a small in the same cardigan and it’s very large and baggy on me. I recommend sizing down for a cleaner look! The draped pockets emphasize the oversized fit. I love this camel color and will be exchanging it for a smaller size. It will look great paired with some leopard flats. This jacket is the reason I went into Old Navy. 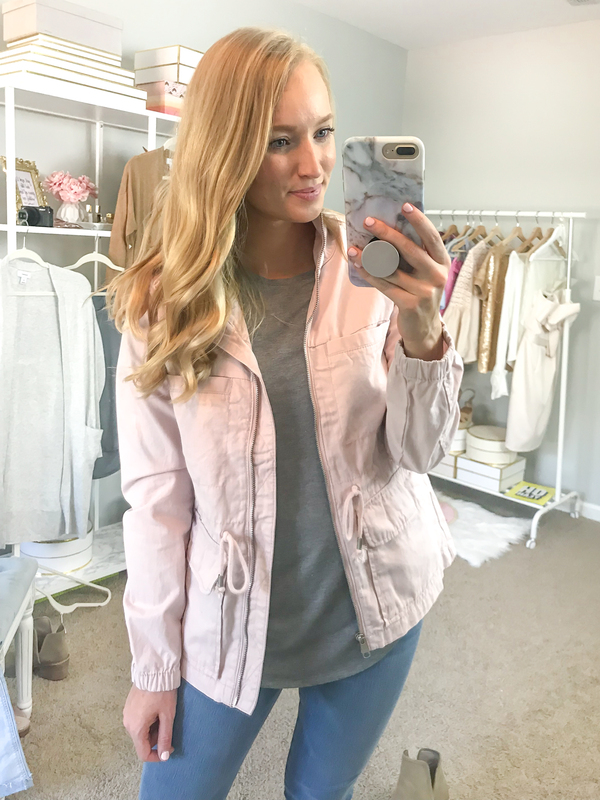 I wanted a similar pink utility jacket last year from Forever 21 but I don’t love F21’s return policy so I rarely order from there. I’m wearing a small and I love all the color options. 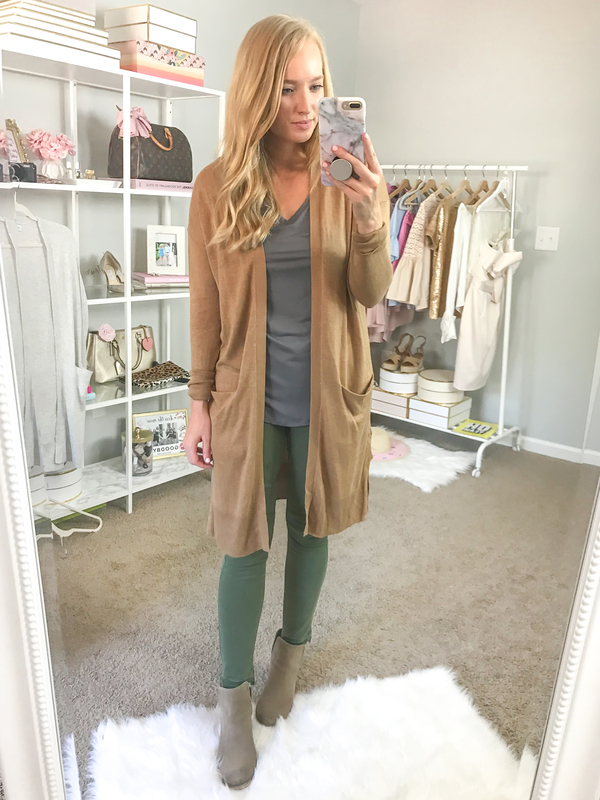 If you already have an olive green jacket for Fall, pick up a different color for this season! I will get a lot of wear out of this. This material is so soft. I think it’s the same as the olive jumpsuit. You can show off your favorite jewelry with these cropped bell sleeves. I’m wearing a small. 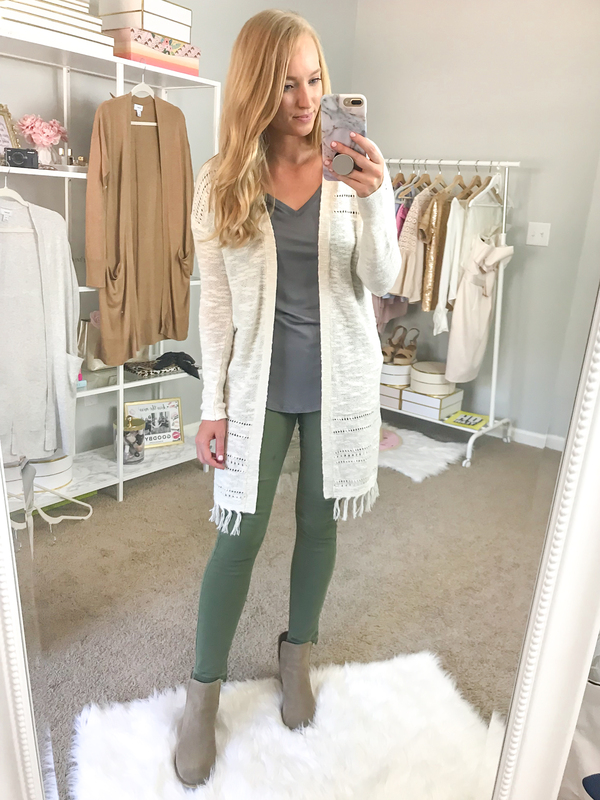 This cardigan is a must-have! It looks like something Free People would have. Here I’m wearing an extra small and it’s so flattering on. The material isn’t as soft and stretchy as the other cardigans. If you have broader shoulder’s I would get your normal size. These are the softest and most comfortable jeans I’ve tried on. Most jeggings don’t have real pockets in the front, but this style does. They don’t look like jeggings, they just feel like it! I’m wearing my normal size 6. This top isn’t a favorite from this haul but it’s comfortable and fits well (I’m wearing a small). I just don’t feel comfortable in boyfriend jeans, I never know how they’re supposed to fit me. Here I sized down to a 4 and they fit well. They remind me of my old softball pants, lol.